Narcissus tazetta growing herbaceous geophyte of the genus Narcissus also known as Paper white flower, Narcissus tazetta perennial deciduous used as ornamental fragrant cut flower plant, can grow in mediterranean, desert, subtropics or temperate climate and growing in hardiness zone 5-11 (if keep the bulbs in cool area over the sleeping season can be grow anywhere). Flower fragrant petals color white, yellow the inner part looks like trumpet the flowers grow on stems. 5 Ziva Paperwhites 13-15cm- Indoor Narcissus: Narcissus Tazetta: Nice, Healthy Bulbs for Holiday Forcing!! 15 Ziva Paperwhites 13-15cm- Indoor Narcissus: Narcissus Tazetta: Nice, Healthy Bulbs for Holiday Forcing!! 30 Ziva Paperwhites 13-15cm- Indoor Narcissus: Narcissus Tazetta--nice, Healthy Bulbs for Holiday Forcing! 40 Ziva Paperwhites ready to grow! 13-15cm- Indoor Narcissus: Narcissus Tazetta: Nice, Healthy Bulbs for Holiday Forcing!! 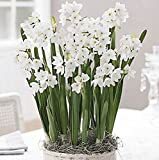 20 Ziva Paperwhites - Indoor Narcissus: Narcissus Tazetta: Nice, Healthy Bulbs for Holiday Forcing!! 10 Ziva Paperwhites 13-15cm- Indoor Narcissus: Narcissus Tazetta: Nice, Healthy Bulbs for Holiday Forcing! !